Make every step count in this year’s South Padre Marathon. It’s simple. After you register, create an everydayhero fundraising page for your favorite cause. Choose your cause and set a goal. Then, share it with friends, track your training, and make a difference.You can choose to fundraise for one of our featured charities or find one that speaks to you – because at the end of the day, it’s up to you to make every step count. Interested in volunteering for the race? Click here! – Pre race shuttles will run from 4:30am-5:45am from the 2 shuttle locations: SPI Convention Center, 7355 Padre Blvd, and Schlitterbahn Waterpark, 33261 State Park Road 100. – Post race shuttles will run from the SPI Convention Center to Schlitterbahn from 10am-3pm. – ROAD CLOSURES: The eastbound side of the Causeway will be closed Sunday morning. There will be two-way traffic on the westbound side of the Causeway allowing for access to and from the Island. Highway 100, eastbound lane, will be re routed through S. Shore Drive. Westbound traffic along Hwy 100 will operate as usual. – PARKING CLOSURE: There will be no spectator parking along Gulf Boulevard. No parking will be available at Clayton’s Beach Bar and Grill on race day. 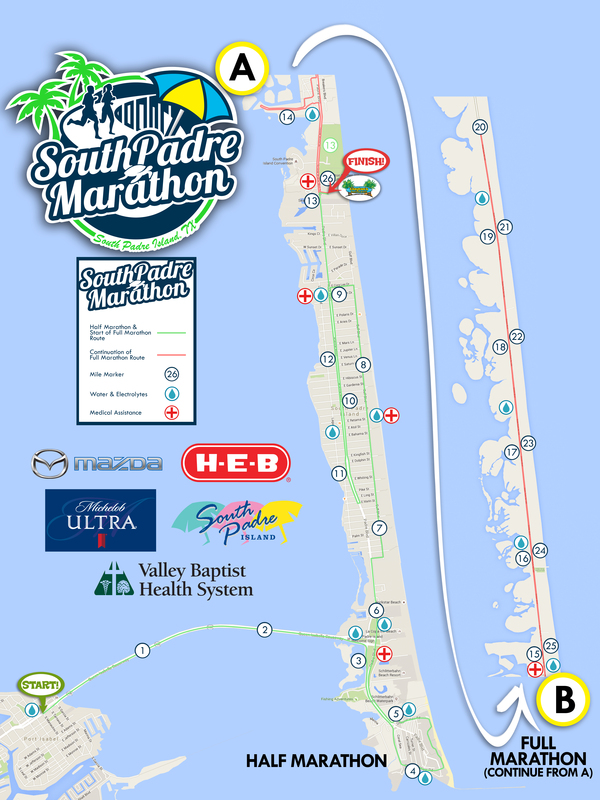 – RUNNER PARKING INFORMATION: Shuttles will run from South Padre Island to the start line in Port Isabel from 4:30 a.m. to 5:45 a.m. Parking is available at South Padre Convention Center and Schlitterbahn Outdoor Water Park. – SPECTATOR PARKING INFORMATION: These shuttles are for registered runners only. North Island parking is available at the South Padre Island Convention Center and Andy Bowie Park. Spaces are limited.